Summary: Difference Between Input and Output is that Input is any data and instructions entered into the memory of a computer. People have a variety of options for entering data and instructions into a computer. Output is data that has been processed into a useful form. That is, computers process data (input) into information (output). Input is any data and instructions entered into the memory of a computer. People have a variety of options for entering data and instructions into a computer. An input device is any hardware component that allows users to enter data and instructions into a computer. 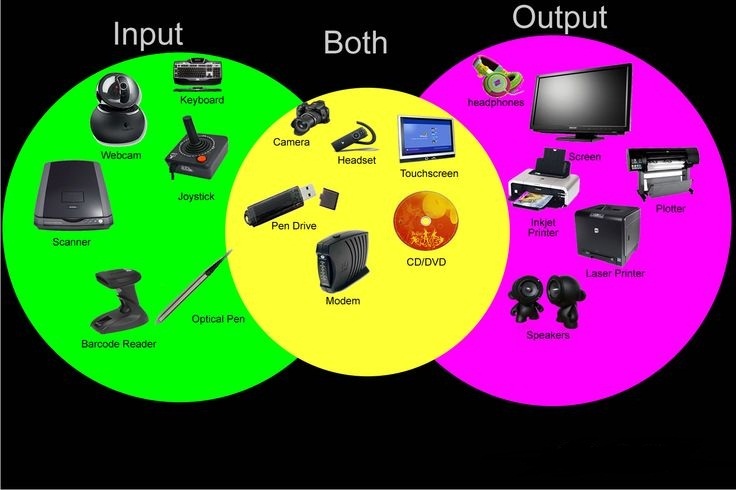 Most commonly used input devices are discussed below. Many people use a keyboard as one of their input devices. A keyboard is an input device that contains keys users press to enter data and instructions into a computer. All desktop computer keyboards have a typing area that includes the letters of the alphabet, numbers, punctuation marks, and other basic keys. Many desktop computer keyboards also have a numeric keypad on the right side of the keyboard. Most of today’s desktop computer keyboards are enhanced keyboards. An enhanced keyboard has 12 or more function keys along the top and a set of arrow and additional keys between the typing area and the numeric keypad. Function keys are special keys programmed to issue commands to a computer. A mouse is a pointing device that fits comfortably under the palm of your hand. With a mouse, users control the movement of the pointer. As you move a mouse, the pointer on the screen also moves. Generally, you use the mouse to move the pointer on the screen to an object such as a button, a menu, an icon, a link, or text. Then, you press a mouse button to perform a certain action associated with that object. Most desktop computer users today have some type of optical mouse, which uses devices that emit and sense light to detect the mouse’s movement. Some use optical sensors, and others use a laser. The latter, often referred to as a laser mouse, usually is more expensive than the former. Output is data that has been processed into a useful form. That is, computers process data (input) into information (output). Users view or watch output on a screen, print it, or hear it through speakers, headphones, or earbuds. While working with a computer, a user encounters four basic types of output: text, graphics, audio, and video. Very often, a single form of output, such as a Web page, includes more than one of these types of output. An output device is any hardware component that conveys information to one or more people. Commonly used output devices include display devices; printers; speakers, headphones, and ear buds; data projectors; and interactive whiteboards. Most commonly used output devices are discussed below. An LCD monitor is a desktop monitor that uses a liquid crystal display to produce images. These monitors produce sharp, flicker-free images. LCD monitors have a small footprint; that is, they do not take up much desk space. LCD monitors are available in a variety of sizes, with the more common being 19, 20, 22, 24, 26, 27, and 30 inches — some are 45 or 65 inches. Most are widescreen, which are wider than they are tall. You measure a monitor the same way you measure a television, that is, diagonally from one corner to the other.